It all began with a series of converging obsessions. There was the braid of violet-blue Cheviot that kept following me from festival to festival, daring me to buy and spin it; there was my perpetual quest for the perfect sock yarn; there was the constant interest in experimenting with construction angles and examining how they affect ease and stretch; there was the growing desire to play with ever more saturated colors. And at last what began as Platycodon now emerges as Glomerata. There's some thematic consistency in that the design is all bellflower all the time, but it isn't packed as chock-full of subtext as some of my more "out-there" work - I suppose you could call it an etude rather than a tone poem. The sock is worked toe-up from a toe-tip cast-on. It features two classic floral lace patterns and a short-row heel set amid plenty of extra ease at the instep; it's topped with a row of gently-curved garter stitch petals. I wanted the Dayflower panels to mirror each other on top of the foot and then diverge above the heel to climb up the sides of the ankle - and so they do, after being pushed apart over the instep by another form of bellflower patterning that finds an echo up the back. 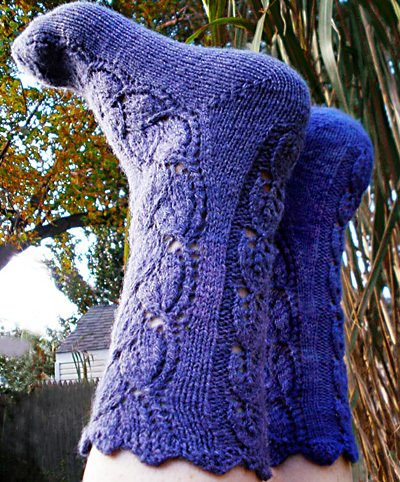 Side effects: the Dayflower pattern appears prim and strait-laced on the top of the foot, the contrary motion keeping its natural waviness in check; then as it veers away from center each panel recovers its normal undulating momentum; it also makes a sweeping angled curve over the ankle bone, biasing the fabric and giving it a snug yet stretchy fit. Don't let the laciness fool you: this is a cozy-warm sock. And if the floral shapes and the touch of deep rich color remind you of spring just as you're starting to batten down your hatches for winter... well, how terrible is that? See notes on gauge, ease and sizing. See Pattern notes on gauge, ease and sizing. Gnomespun Dorset or Cheviot roving, 4 oz braid (or equivalent amount of your own favorite sock blend); color: Balloonflower, Platycodon, or Lobelia. Spinning Tool: I generally use an antique saxony production wheel, double-drive, with an effective ratio of about 16:1. Niddy Noddy: I love the counting skeinwinders from Oregon Woodworker or Ball and Skein. Lazy Kate: mine is improvised from a squirrel-cage swift, but I recommend something like the Will Taylor JMC Kate, or anything that will accommodate 4 bobbins, ideally at an angle slightly off the vertical. I've made this sock in three different 4-ply yarns. The first was a handspun that turned out slightly denser than I wanted it, resulting in a gauge of 7 stitches to the inch; the other two, handspun and millspun respectively, yielded my preferred gauge of 8 stitches to the inch. (The second batch of handspun was my own blend, based on the same formula used for my custom milspun yarn: 70% wool / 30% silk.) For this pattern I've expanded my typical sizing range accordingly, to allow you to adjust as needed for the grist of your own handspun. At 8 sts per inch, working the first set of numbers gives a sock 7 inches in circumference, the second set gives a sock 8 inches in circumference, and the third set gives a sock 9 inches in circumference. At 7 sts per inch, working the first set of numbers gives a sock 8 inches in circumference, the second set gives a sock 9 inches in circumference, and the third set gives a sock 10.25 inches in circumference. Note that I intend my socks to be worn with about 10% negative ease, so that a foot with a 9 inch circumference should wear a sock 8 inches in circumference. I have fairly strong views on this subject; yours may vary, of course, so take mine with salt to taste. Let’s be clear on this from the outset: Where socks are concerned, I am the Anti-Merino. It's my considered opinion that Merino is just about the least appropriate fiber possible for sock purposes. Granted, it's very soft; but that is really its only virtue, and I find that in some 95% of cases the importance of softness in socks is vastly overrated. Overly soft socks tend to be short-lived socks; they sacrifice staying power for dubious comfort. Use a soft fiber like Merino, spin it into a soft yarn, and knit it into a soft fabric, and what do you get? Insufficient twist and density. A sock meeting those criteria will not hold its shape, will not stand up to friction, will not cushion your foot. The best socks are perfectly fitted; they're constructed at a tight gauge, from a high-twist yarn that has plenty of inherent strength and spring - those are the attributes that will give you both comfort and lasting wear. This is why I love to begin with downs breeds, such as Cheviot and Dorset, with their strong spiral crimp; this is why my own custom millspun uses a blend of several wools ranging from Targhee to Southdown, with silk for added strength and smoothness and shine. What I love best is a crisp round yarn with plenty of strong plying twist and high stitch definition; I'm still working toward the perfect balance of spring and strength, but my most tried and true formula so far is a four-ply: Fine lofty singles spun point-of-twist from a woollen prep (roving, typically - or a batt if I've done the blending myself), plied together hard - I suggest an angle of twist not less than 40 degrees. If four-ply seems a little crazy to you, spin a three-ply. (But don’t settle for two-ply. The loss of roundness and substance is exponential; I have yet to see a two-ply that makes good socks.) Don't be afraid to underspin the singles just a touch, then compensate with apparent overplying. The result may not meet the standard definition of a "balanced" yarn - at least not until after you've set the twist - but it will be strong and bouncy and stretchy enough to make a beautiful cushy sock; one that will last and last. There; that's my two cents' worth on how it should be done. Now go forth and spin the sock yarn YOU like best! M1L: Insert left needle, from front to back, under strand of yarn which runs between last stitch on left needle and first stitch on right needle; knit this stitch through back loop. 1 stitch increased. M1R: Insert left needle, from back to front, under strand of yarn which runs between last stitch on left needle and first stitch on right needle; knit this stitch through front loop. 1 stitch increased. M1p: Make 1 stitch purlwise: Insert left needle, from front to back, under strand of yarn which runs between last stitch on left needle and first stitch on right needle; purl this stitch through back loop. 1 stitch increased. Method #1: Yo on left needle, use tip of right needle to pass 3 sts over the loop, one at a time; then transfer the finished st to right needle. Method #2: K1, slip the st to left needle, and pass the next 2 sts over it. Method #3: K2tog, slip the st to left needle, and pass the next st over it, then transfer the finished st to right needle. 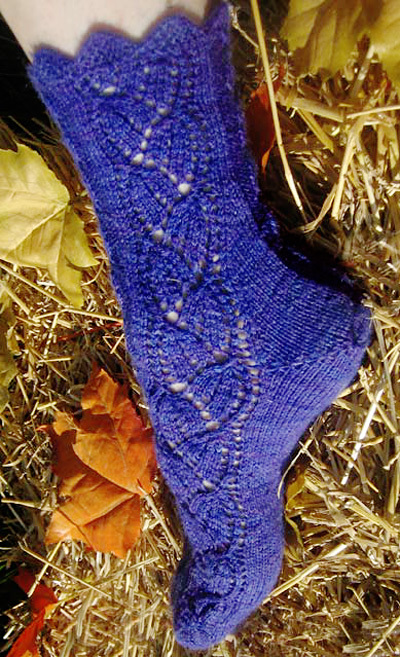 Patterning on the toe is a partial version of the mirrored Dayflower pattern that is worked on the top of the sock. Rows 1 & 3: Yo, ssk, k1, (ssk, yo) twice, k2, (yo, k2tog) twice, k1, k2tog, yo. Row 2 (and all other odd-numbered rows): K.
Rows 5 & 7: Yo, ssk, k2, yo, ssk, k1, (ssk, yo) twice, k2, (yo, k2tog) twice, k1, k2tog, yo, k2, k2tog, yo. Row 9: Yo, k3, yo, k2, ssk twice, (ssk, yo) twice, k2, (yo, k2tog) twice, k2tog twice, k2, yo, k3, yo. Worked in the round (all RS) on 15 sts; count varies in rows 3-5, 11-13. Row 1: (Yo, k2tog) twice, k2tog twice, k2, yo, k3, yo, ssk, yo. Row 3: Yo, k2tog, k3tog twice, yo, k1, yo, k2, (ssk, yo) twice. Row 5: Yo, k3tog, yo, k3, yo, k2, (ssk, yo) twice. Row 7: Yo, k2tog, yo, k1, yo, k2, ssk, yo, k2, (ssk, yo) twice. Row 9: Yo, k2tog, yo, k3, yo, k2, ssk twice, (ssk, yo) twice. Row 11: (Yo, k2tog) twice, k2, yo, k1, yo, sll 1-sll 1-k1-p2sso twice, ssk, yo. Row 12: K to 3 before end, ssk, k2. Row 13: (Yo, k2tog) twice, k2, yo, k3, yo, sll 1-sll 1-k1-p2sso, yo. Row 15: (Yo, k2tog) twice, k2, yo, k2tog, k2, yo, k1, yo, ssk, yo. Row 1: Yo, k2tog, yo, k3, yo, k2, ssk twice, (ssk, yo) twice. Row 3: (Yo, k2tog) twice, k2, yo, k1, yo, sll 1-sll 1-k1-p2sso twice, ssk, yo. Row 5: (Yo, k2tog) twice, k2, yo, k3, yo, sll 1-sll 1-k1-p2sso, yo. Row 7: (Yo, k2tog) twice, k2, yo, k2tog, k2, yo, k1, yo, ssk, yo. Row 9: (Yo, k2tog) twice, k2tog twice, k2, yo, k3, yo, ssk, yo. Row 11: Yo, k2tog, k3tog twice, yo, k1, yo, k2, (ssk, yo) twice. Row 12: K2, k2tog, k to end. Row 13: Yo, k3tog, yo, k3, yo, k2, (ssk, yo) twice. Row 15: Yo, k2tog, yo, k1, yo, k2, ssk, yo, k2, (ssk, yo) twice. Setup Row 1 (once only): P2[3, 4], yo, k1, yo, p2[3, 4]. Setup Row 2 (once only): P2[3, 4], k3, p2[3, 4]. Row 1: P2[3, 4], k1, yo, k1, yo, k1, p2[3, 4]. Row 2: P2[3, 4], k5, p2[3, 4]. Row 3: P2[3, 4], k2, yo, k1, yo, k2, p2[3, 4]. Row 4: P2[3, 4], k7, p2[3, 4]. Row 5: P2[3, 4], ssk, k1, yo, k1, yo, k1, k2tog, p2[3, 4]. Row 6: P2[3, 4], k7, p2[3, 4]. Row 7: P2[3, 4], ssk, k1, k2, k2tog, p2[3, 4]. Row 8: P2[3, 4], k5, p2[3, 4]. Row 9: P2[3, 4], ssk, k1, k2tog, p2[3, 4]. Row 10: P2[3, 4], k3, p2[3, 4]. Row 11: P2[3, 4], yo, S2KP2, yo, p2[3, 4]. Row 12: P2[3, 4], k3, p2[3, 4]. Row 1 [RS]: P2[3, 4], k1, yo, k1, yo, k1, p2[3, 4]. Row 2 [WS]: K2[3, 4], p5, k2[3, 4]. Row 3 [RS]: P2[3, 4], k2, yo, k1, yo, k2, p2[3, 4]. Row 4 [WS]: K2[3, 4], p7, k2[3, 4]. Row 5 [RS]: P2[3, 4], ssk, k1, yo, k1, yo, k1, k2tog, p2[3, 4]. Row 6 [WS]: K2[3, 4], p7, k2[3, 4]. Row 7 [RS]: P2[3, 4], ssk, k1, k2, k2tog, p2[3, 4]. Row 8 [WS]: K2[3, 4], p5, k2[3, 4]. Row 9 [RS]: P2[3, 4], ssk, k1, k2tog, p2[3, 4]. Row 10 [WS]: K2[3, 4], p3, k2[3, 4]. Row 11 [RS]: P2[3, 4], yo, S2KP2, yo, p2[3, 4]. Row 12 [WS]: K2[3, 4], p3, k2[3, 4]. Worked flat on a foundation of 1 st; stitch count varies from row to row but is restored in R14. Notes: Decrease at end of WS rows is worked on last st of edging and next st of sock. For the first repeat of the pattern you will not need to slip the first st in R1; simply use the next st on left needle as the base st for the cast-on. Feel free to substitute m1R for m1L in this edging; because you’re working garter stitch it really doesn’t matter which way the decreases lean. Row 1: Sl 1, CO 2 using cable cast on. Row 2: K1, k1 tbl, k2tog. Row 3: Sl 1, k1, m1L, k1. Row 4: Sl 1, k2, k2tog. Row 6: Sl 1, k3, k2tog. Row 8: Sl 1, k4, k2tog. Row 14: Sl 1, k1, k2tog, pass 2nd & 3rd sts over last st worked; 1 st on needle. Repeat these 14 rows for pattern. Row 15: Sl 1, CO 2 using cable cast on. Row 16: K1, k1 tbl, k2tog. Row 17: Sl 1, k1, m1L, k1. Row 18: Sl 1, k2, k2tog. Row 20: Sl 1, k3, k2tog. Row 22: Sl 1, k4, k3tog. Row 24: Sl 1, k3, k2tog. Row 26: Sl 1, k2, k2tog. Row 28: Sl 1, k1, k2tog, pass 2nd & 3rd sts over last st worked; 1 st on needle. Repeat these 28 rows for pattern. Using the Turkish Cast-On, CO 24[28, 32] sts. The first 12[14, 16] stitches will become the sole; the remaining stitches the instep; distribute stitches on needles accordingly. Setup: K6[7,8] to center of sole, place removable stitch marker to indicate start of round. Round 1: K to last st of sole, m1L, k2, m1R, k to last st of instep, m1L, k2, m1R, k to end of round. 4 sts increased. Repeat these two rounds three times more, and round 1 once more. 44[48, 52] sts. Round 10: K across sole, k3[4, 5], work row 1 of Toe Pattern chart, k to end of round. Round 11: K to last st of sole, m1L, k2, m1R, k2[3, 4] work row 2 of Toe Pattern chart, k to last st of instep, m1L, k2, m1R, k to end of round. 48[52, 56] sts. Round 12: K to last st of sole, k4[5, 6], work row 3 of Toe Pattern chart, k to end of round. Round 13: K to last st of sole, m1L, k2, m1R, k3[4, 5] work row 4 of Toe Pattern chart, k to last st of instep, m1L, k2, m1R, k to end of round. 52[56, 60] sts. Round 14: K to last st of sole, k1[2, 3], work row 5 of Toe Pattern chart, k to end of round. Round 15: K to last st of sole, m1L, k2, m1R, k0[1, 2], work row 6 of Toe Pattern chart, k to last st of instep, m1L, k2, m1R, k to end of round. 56[60, 64] sts. Pattern chart, k to end of round. Round 17: K across sole , k1, m1R, k1[-, -], work row 8 of Toe Pattern chart, k1, m1L. k to end of round. 58 sts. Round 18: K across sole, k1, work row 9 of Toe Pattern chart, k to end of round. Round 19: K across sole,k1, work row 10 of Toe Pattern chart, k to end of round, k until 2 sts rem.This will be the new start of round. Arrange your sts so that there are 34 on instep, 24 on sole. Move your markers if required. Round 17: K to last st of sole, m1L, k2, m1R, k-[2, -], work row 8 of Toe Pattern Chart, k to last st of instep, m1L, k2, m1R, k to end of round. -[64, -] sts. Round 18: K across sole, k-[2, -] work row 9 of Toe Pattern chart, k to end of round. Round 19: K across sole, k-[2, -] work row 10 of Toe Pattern chart, k to end of round, k until 1 st rems. This will be the new start of round. Arrange your sts so that there are 34 on instep, 30 on sole. Round 17: K to last st of sole, m1L, k2, m1R, k-[-, 3], work row 8 of Toe Pattern Chart, k to last st of instep, m1L, k2, m1R, k to end of round. –[-, 68] sts. Round 18: K to end of sole, k-[-, 3] work row 9 of Toe Pattern chart, k to end of round. Round 19: K to last st of sole, m1L, k2, m1R, k-[-, 2], work row 10 of Toe Pattern Chart, k to last st of instep, m1L, k2, m1R, k to end of round. –[-, 72] sts. K to end of sole. This will be the new start of round. 58[64, 72] sts: 34[34, 36] on instep, 24[30, 36] on sole. Foot round 1: K1[1, 2], work Row 11 of Dayflower Left pattern, k2, work Row 11 of Dayflower Right pattern, k to end of round. Foot round 2: K1[1, 2], work Row 12 of Dayflower Left pattern, k2, work Row 12 of Dayflower Right, k to end of round. Foot round 3: K1[1, 2], work Row 13 of Dayflower Left pattern, k2, work Row 13 of Dayflower Right, k to end of round. 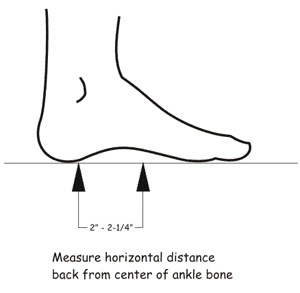 Continue in pattern as set until sock hits a point on your foot 2[2, 2.25] inches before the ankle bone, ending with an even-numbered chart round. See diagram at right for a guide. Round 1: K1[1, 2], work Dayflower Left pattern, k1, m1L, k1, work Dayflower Right, k to end of round. 1 st increased. Round 4: K1[1, 2], work Dayflower Left pattern, k1, m1R, k1, m1L, k1, work Dayflower Right, k to end of round. 2 sts increased. Round 7: K1[1, 2], work Dayflower Left pattern, k2, m1R, k1, m1L, k2, work Dayflower Right, k to end of round. 2 sts increased. Round 10: K1[1, 2], work Dayflower Left pattern, k3, place marker, m1p, k1, m1p, place marker, k3, work Dayflower Right, k to end of round. The markers will be used later to place the Campanula pattern. 2 sts increased. Round 13: Round 10: K1[1, 2], work Dayflower Left pattern, k3, p1, m1p, k1, m1p, p1, k3, work Dayflower Right, k to end of round. 2 sts increased. Stitch count varies in patterns, but you should have 11[11, -] sts in the center between the Dayflower patterns, 5 sts between the markers. Round 16: K1, work Dayflower Left pattern, k3, p2, k1, p2, k3, work Dayflower Right, k1, m1R, k to last st of round, m1L, k1. 26[32, -] sts on sole. Round 17: K1, work Dayflower Left pattern, k3, p2, yo, k1, yo, p2, k3, work Dayflower Right, k to end of round. Round 18: K1, work Dayflower Left pattern, k3, p2, k3, p2, k3, work Dayflower Right, k to end of round. Round 19: K1, work Dayflower Left pattern, k3, p2, k1, yo, k1, yo, k1, p2, k3, work Dayflower Right, k1. Round 16: K2, work Dayflower Left pattern, k3, p2, m1p, k1, m1p, p2, k3, work Dayflower Right, k to end of round. Stitch count varies in patterns, but you should have -[-, 13] sts in the center between the Dayflower patterns, 7 sts between the markers. Round 19: K2, work Dayflower Left pattern, k3, p3, yo, k1, yo, p3, k3, work Dayflower Right, k to end of round. Round 20: K2, work Dayflower Left pattern, k3, p3, k3, p3, k3, work Dayflower Right, k to end of round. Round 21: K2, work Dayflower Left pattern, k3, p3, k1, yo, k1, yo, k1, p3, k3, work Dayflower Right, k2. Row 1 [RS]: K25[31 , 35], w&t. Row 2 [WS]: P24[30, 34], w&t. Row 3 [RS]: K23[29, 33], w&t. Row 4 [WS]: P22[28, 32], w&t. Row 5 [RS]: K21[27, 31], w&t. Row 6 [WS]: P20[26, 30], w&t. Row 7 [RS]: K19[25, 29], w&t. Row 8 [WS]: P18[24, 28], w&t. Row 9 [RS]: K17[23, 27], w&t. Row 10 [WS]: P16[22, 26], w&t. Row 11 [RS]: K15[21, 25], w&t. Row 12 [WS]: P14[20, 24], w&t. Row 13 [RS]: K13[19, 23], w&t. Row 14 [WS]: P12[18, 22], w&t. Size S only: Proceed to Heel Turn Step 2. Row 15 [RS]: K-[17, 21], w&t. Row 16 [WS]: P-[16, 20], w&t. Row 17 [RS]: K-[15, 19], w&t. Row 18 [WS]: P-[14, 18], w&t. Size M only: Proceed to Heel Turn Step 2. Row 19 [RS]: K-[-, 17], w&t. Row 20 [WS]: P-[-, 16], w&t. Row 1 [RS]: K12[14, 16], work wrapped st together with its wrap, w&t. Row 2 [WS]: P13[15, 17], work wrapped st together with its wrap w&t. Row 3 [RS]: K7, m1L, k7, work double-wrapped st together with its wraps, w&t. Row 4 [WS]: P16, work double-wrapped st together with its wraps, w&t. Row 5 [RS]: K6, p2, yo, k1, yo, p2, k6, work double-wrapped st together with its wraps, w&t. Row 6 [WS]: P7, k2, p3, k2, p6, work double-wrapped st together with its wraps, w&t. Row 7 [RS]: K7, work Row 1 of Campanula Pattern, k7, work double-wrapped st together with its wraps, w&t. Row 8 [WS]: P8, work Row 2 of Campanula Pattern, p7, work double-wrapped st together with its wraps, w&t. Note: this is not a typo. In this next row, you skip ahead in the Campanula pattern. It is to make the patterning line up with the fronts of the leg. Row 9 [RS]: K8, work Row 9 of Campanula Pattern, k8, work double-wrapped st together with its wraps, w&t. Row 10 [WS]: P9, work Row 10 of Campanula Pattern, p8, work double-wrapped st together with its wraps, w&t. Row 11 [RS]: K9, work Row 11 of Campanula Pattern, k9, work double-wrapped st together with its wraps, w&t. Row 12 [WS]: P10, work Row 12 of Campanula Pattern, p9, work double-wrapped st together with its wraps, w&t. 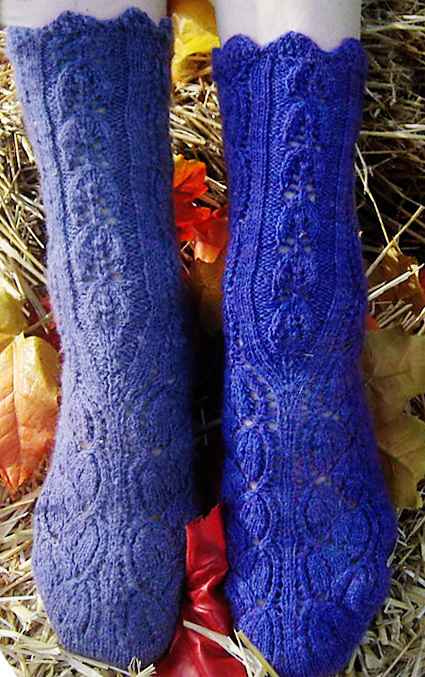 Row 13 [RS]: K10, work Row 1 of Campanula Pattern, k10, work double-wrapped st together with its wraps, w&t. Proceed to REJOIN THE ROUND. Row 3 [RS]: K8, m1L, k8, work double-wrapped st together with its wraps, w&t. Row 4 [WS]: P18, work double-wrapped st together with its wraps, w&t. Row 5 [RS]: K6, p3, yo, k1, yo, p3, k6, work double-wrapped st together with its wraps, w&t. Row 6 [WS]: P7, k3, p3, k3, p6, work double-wrapped st together with its wraps, w&t. Row 7 [RS]: K7, work Row 1 of Campanula Pattern Size M, k7, work double-wrapped st together with its wraps, w&t. Row 8 [WS]: P8, work Row 2 of Campanula Pattern Size M, p7, work double-wrapped st together with its wraps, w&t. Row 9 [RS]: K8, work Campanula Pattern Size M, k8, work double-wrapped st together with its wraps, w&t. Row 10 [WS]: P9, work Campanula Pattern Size M, p8, work double-wrapped st together with its wraps, w&t. Row 11 [RS]: K9, work Campanula Pattern Size M, k9, work double-wrapped st together with its wraps, w&t. Row 12 [WS]: P10, work Campanula Pattern Size M, p9, work double-wrapped st together with its wraps, w&t. Row 13 [RS]: K10, work Campanula Pattern Size M, k10, work double-wrapped st together with its wraps, w&t. Row 14 [WS]: P11, work Campanula Pattern Size M. p10, work double-wrapped st together with its wraps, w&t. Row 15 [RS]: K11, work Campanula Pattern Size M, k11, work double-wrapped st together with its wraps, w&t. Row 16 [WS]: P12, work Campanula Pattern Size M, p11, work double-wrapped st together with its wraps, w&t. Row 17 [RS]: K12, work Campanula Pattern Size M, k12, work double-wrapped st together with its wraps, w&t. Row 18 [WS]: P13, work Campanula Pattern Size M, p12, work double-wrapped st together with its wraps, w&t. Row 19 [RS]: K13, work Campanula Pattern Size M, k13, work double-wrapped st together with its wraps. Row 3 [RS]: K18, work double-wrapped st together with its wraps, w&t. Row 4 [WS]: P19, work double-wrapped st together with its wraps, w&t. Row 5 [RS]: K10, m1L, k10, work double-wrapped st together with its wraps, w&t. Row 6 [WS]: P22, work double-wrapped st together with its wraps, w&t. Row 7 [RS]: K7, p4, yo, k1, yo, p4, k7, work double-wrapped st together with its wraps, w&t. Row 8 [WS]: P8, k4, p3, k4, p7, work double-wrapped st together with its wraps, w&t. Row 9 [RS]: K8, work Row 1 of Campanula Pattern Size L, k8, work double-wrapped st together with its wraps, w&t. Row 10 [WS]: P9, work Row 2 of Campanula Pattern Size L, p8, work double-wrapped st together with its wraps, w&t. Row 11 [RS]: K9, work Campanula Pattern Size L, k9, work double-wrapped st together with its wraps, w&t. Row 12 [WS]: P10, work Campanula Pattern Size L, p9, work double-wrapped st together with its wraps, w&t. Row 13 [RS]: K10, work Campanula Pattern Size L, k10, work double-wrapped st together with its wraps, w&t. Row 14 [WS]: P11, work Campanula Pattern Size L, p10, work double-wrapped st together with its wraps, w&t. Row 15 [RS]: K11, work Campanula Pattern Size L, k11, work double-wrapped st together with its wraps, w&t. Row 16 [WS]: P12, work Campanula Pattern Size L, p11, work double-wrapped st together with its wraps, w&t. Row 17 [RS]: K12, work Campanula Pattern Size L, k12, work double-wrapped st together with its wraps, w&t. Row 18 [WS]: P13, work Campanula Pattern Size L, p12, work double-wrapped st together with its wraps, w&t. Row 19 [RS]: K13, work Campanula Pattern Size L, k13, work double-wrapped st together with its wraps, w&t. Row 20 [WS]: P14, work Campanula Pattern Size L, p13, work double-wrapped st together with its wraps, w&t. Row 21 [RS]: K14, work Campanula Pattern Size L, k14, work double-wrapped st together with its wraps. Round 1: Insert needle upward through the wraps on the st you just worked and place them on left needle, k3tog (the first stitch of the round and the two wrap loops), work in pattern as set to marker, p2[2,3], k5, p2[2,3], k to 1 st before end of instep, insert needle from below into the wraps of the sole st; sl these loops to left needle and k3tog tbl (the last stitch of the instep and the two wrap loops). Round 2: K1[1, 2], work in pattern as set to marker, p2[2,3], k2, yo, k1, yo, k2, p2[2, 3], work in pattern as set to end of round. Round 3: K1[1, 2], work in pattern as set to marker, p2[2,3], k7, p2[2, 3], work in pattern as set to end of round. At this point the two Dayflower panels which formed the instep have shifted part way around toward the sides of the ankle; as you work the ease decreases they will begin to climb straight up the sides. After a few decrease rows you may want to redistribute stitches on the needles for ease of working. 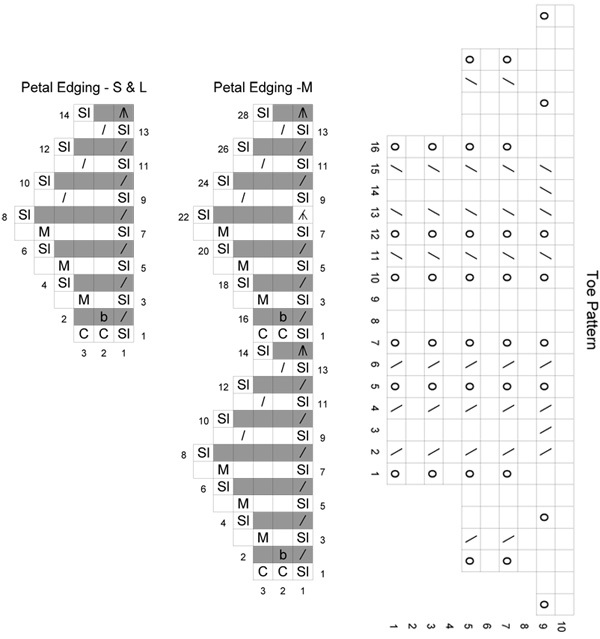 Ankle Setup: K1[-, -], work in pattern as set to marker, p2[-, -], ssk, k1, yo, k1, yo, k1, k2tog, p2[-, -], work Dayflower Right, k1[-, -], ssk, k to beginning of back Campanula Panel, work Campanula Pattern Size S, k to last 2 sts of round, k2tog, k1. 2 sts decreased, and start of round shifted over by 1 st. 2 sts decreased. Ankle Setup: K-[1, 2], work in pattern as set to marker, m1p, p-[2, 3], ssk, k1, yo, k1, yo, k1, k2tog, p-[2,3], m1p, work Dayflower Right, k1[1, 2], ssk, k to beginning of back Campanula Panel, work appropriate size Campanula Pattern, k to last 2 sts of round, k2tog, , k-[1,2]. Start of round shifted over by -[1, 2] sts. Note: Setup for front Campanula panel is now complete; start at Row 6 of appropriate size Campanula pattern in next round. Ankle Round 1: Work Dayflower Left, k3, work appropriate Campanula pattern, k3, work Dayflower Right, k to beginning of back Campanula panel, work back Campanula panel, k to end of round. Ankle Round 2: Work Dayflower Left, k3, work appropriate Campanula pattern, k3, work Dayflower Right, k to beginning of back Campanula panel, work back Campanula panel, k to end of round. Ankle round 3: Work Dayflower Left, k3, work appropriate Campanula pattern, k3, work Dayflower Right, k1, ssk, k to beginning of back Campanula panel, work back Campanula panel, k to last 2 sts of round, k2tog. 2 sts decreased. Repeat the last 3 rounds 7[10, 12] more times, until only 3 sts remain between Dayflower Right and Campanula Back, and between Campanula Back and Dayflower Left. Leg round: Work Dayflower Left, k3, work appropriate size of Campanula pattern, k3, work Dayflower Right, k3, work appropriate size of Campanula pattern, k3. Work even in pattern up the ankle for another 3 inches or until desired height; ending after a row 4 or 12 of the Dayflower pattern. 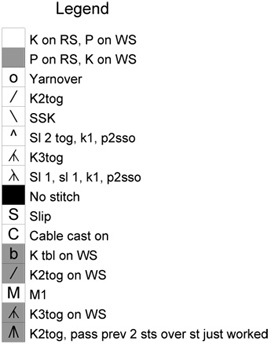 Choose accordingly from the following setup rounds to complete the leg patterning, and where required restore a final stitch count of 56[60, 64]. At this point, the count of the Dayflower motifs will be restored to the original 15, but depending on where you are in the Campanula pattern, your stitch count will still vary. Work another 6 rounds in pattern as set, ending with Row 2 or 10 of the Dayflower Patterns and Row 8 of the Campanula Pattern. Work Adjustment Round 1: K to front Campanula Panel, work Row 9 of Campanula Pattern, k to back Campanula Panel, work Row 9 of Campanula Pattern, k to end of round. Work another 6 rounds in pattern as set, ending with Row 2 or 10 of the Dayflower Patterns and Row 10 of the Campanula Pattern. Work another 4 rounds in pattern as set, ending with Row 8 or 16 of the Dayflower Patterns and Row 10 of the Campanula Pattern. Work another 4 rounds in pattern as set, ending with Row 8 or 16 of the Dayflower Patterns and Row 12 of the Campanula Pattern. Work another 2 rounds in pattern as set, ending with Row 6 or 14 of the Dayflower Patterns and Row 12 of the Campanula Pattern. Work Adjustment Round 2: K1[1, 2], work next row of Dayflower Left , k3, p2[3, 4], k3, p2[3, 4], k3, work next row of Dayflower Right, k3, p2[3, 4], k3, p2[3, 4], k3. Repeat this Adjustment Round once. Work Adjustment Round 2 (see #5, above) 4 times. The Petal Edging is worked flat in garter stitch, perpendicular to the sock, and attaches to one (or two) live sock stitches (binding it off in the process) for every two rows. Work appropriate size of Petal Edging chart around until 1 st rems. At end of Petal Edging, break yarn. Thread the end on a tapestry needle and work it in to meet the original base st, hiding the join of the beginning and end of the edging. Having survived several overlapping careers in the performing arts, a stint as a computer consultant and another as a culinary historian, Lisa Grossman has returned to her early passion for textiles and been reborn as the Tsarina of Tsocks. She brings all of the above - plus the kitchen sink and a huge pile of knitted leaves - to her crazy-making creations, which can be found here, as well as on the feet and needles of many notable knitting cognoscenti. Taught by her mother and inspired by the independence of Elizabeth Zimmermann, Lisa has been knitting for nearly half a century; she vaguely remembers following a pattern once, before striking out into her own road-less-traveled-by. She teaches her “Art for your Feet” brand of inspired lunacy, most recently at Sock Summit 2011. She is the surviving co-author of Lobscouse & Spotted Dog (which one critic called "the only cookbook that will ever find a place on my nightstand"), and has written for Tin House Literary Quarterly, Napoleon Journal, the New York Times, and Spindlicity. Her door is always open in the Tsock Flock group on Ravelry.